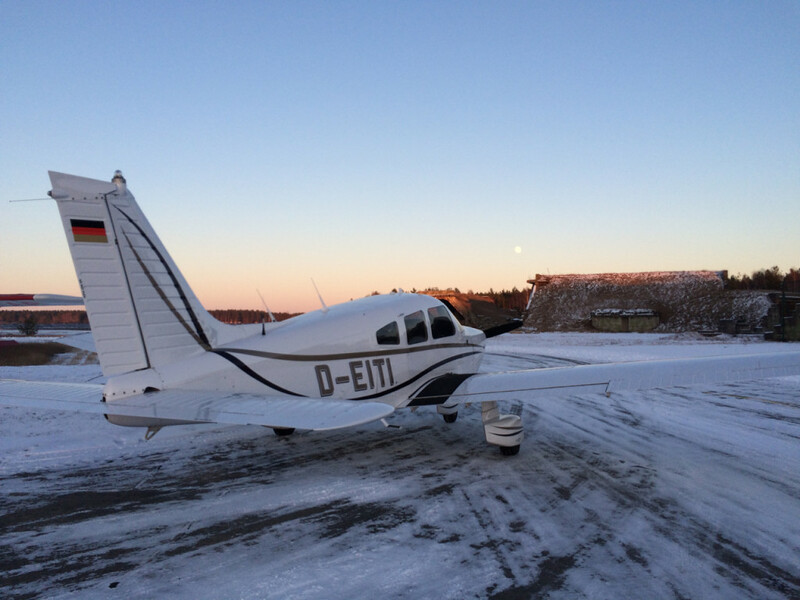 The days are getting longer, the sun is coming back from its winter break – time to shake off the frost and get into the air! 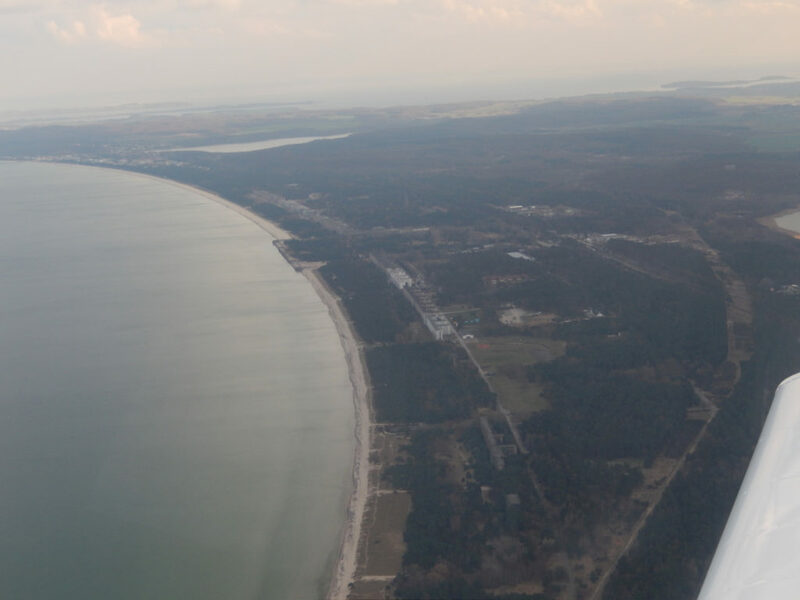 My destination for today is the island of Rügen. It is just under one flight hour away but a different world. I love coming here in the summer for the beautiful beaches and the fresh fish. Todays trip will be in the spirit of pickled Hering. 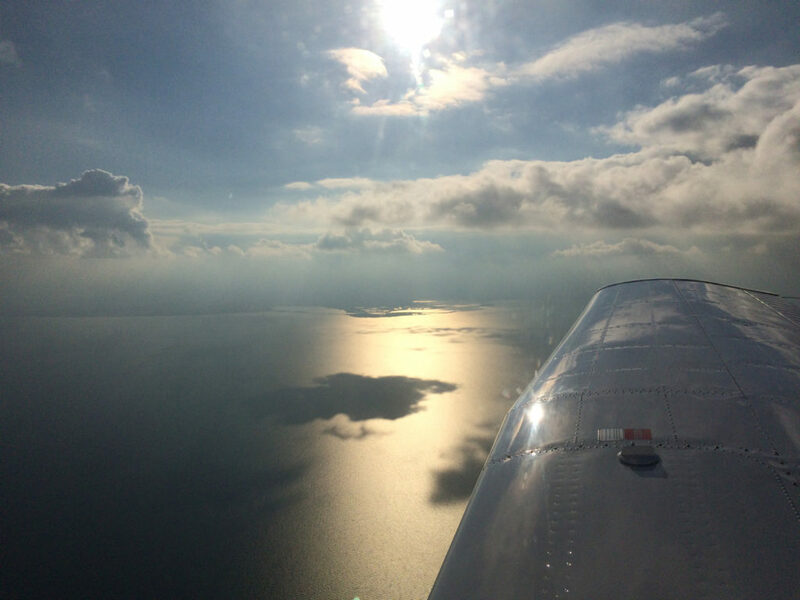 It is a great tradition in general aviation to go places for the purpose of having a meal. It does not always have to be a hamburger, and it is almost never limited to 100 dollars any more. But the „100 dollar hamburger“ still has a nice ring to it. Flying to the beach with the family is one of my plans for the coming summer. Todays objective is training, scouting, and just having a good time in the air! The visibility is okay and the clouds are few and high. I file a flight plan, because when I think about it, I realized how long I have not done that. The waypoint is the Friedland VOR (FLD) and the CDI needle is glued to the center in the smooth air. The island airport is not big and there is no easy-to-spot landmark close bye. I remember the smirk on my flight instructors face on my first visit here. I did not spot the runway until I was almost in the pattern. This time I know what to look for. It is early in the season and there is not much going on. A tired Cessna is flying the first tourists over their vacation homes. The Restaurant will be buzzing in the summer, but now only one other table is occupied. 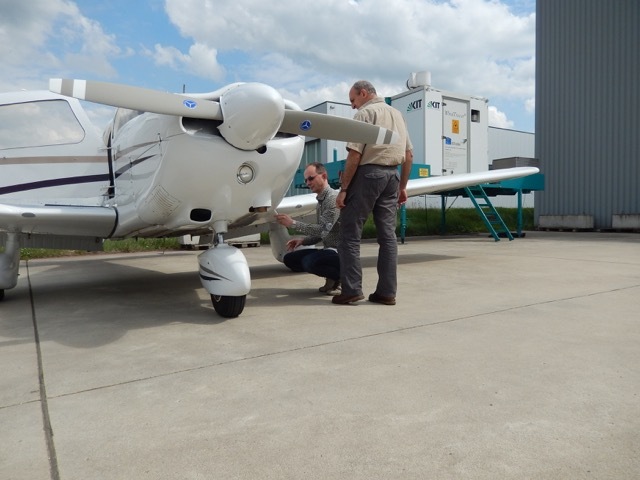 We quickly start chatting, a flight instructor and his student. 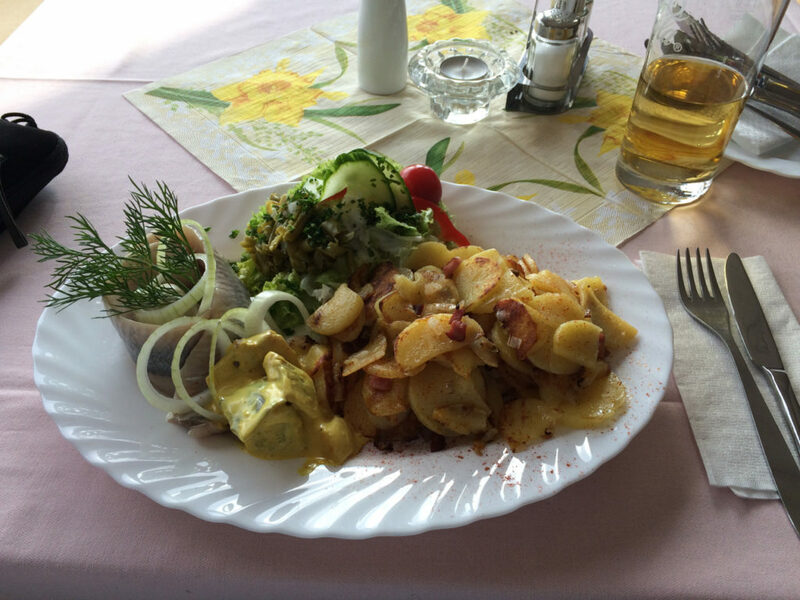 The fish is excellent and all the way home I am looking forward to my next visit here in the summer. We are on the way to the airport. My flying friend and I are full of excitement. Our passenger is eying the sky with suspicion. It has been gray and drewry for days and the sun has a difficult time to break through the clouds now. Neither one of the pilots is worried though. We have the been studying the weather for days and today is going to be gorgeous! Our schedule is tight. We are planning a nice and relaxed summer day all crambed into the few precious sun hours of this short winter morning has to offer. The trip is about flying and about scouting the destination for future reference. The pilots are looking forward to the trip – the passengers have yet to understand the extend of our craziness. On the way there we practice old fashioned visual navigation. My flying friend has made a detailed flight plan. GPS and auto pilot stay off and we are consulting over the map and try to identify the landmarks. 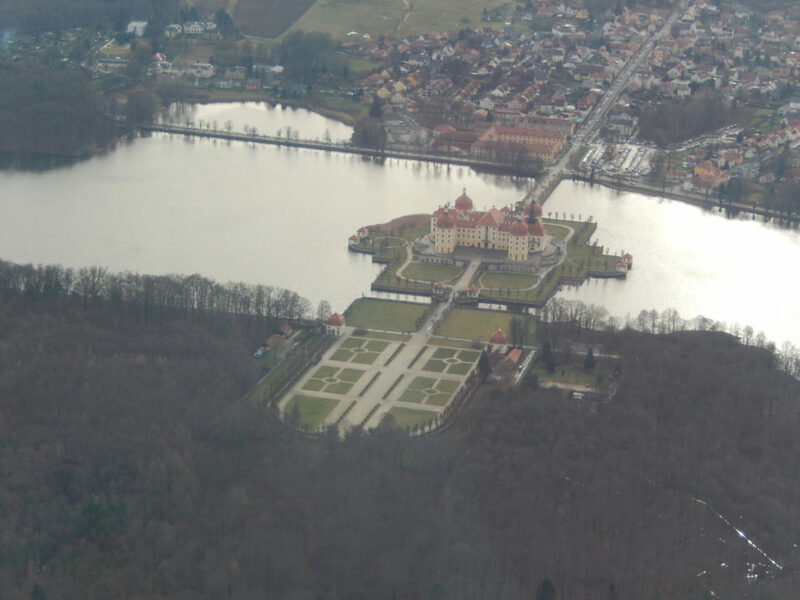 We reach our destination within two minutes of the flight planned time. Not too bad! 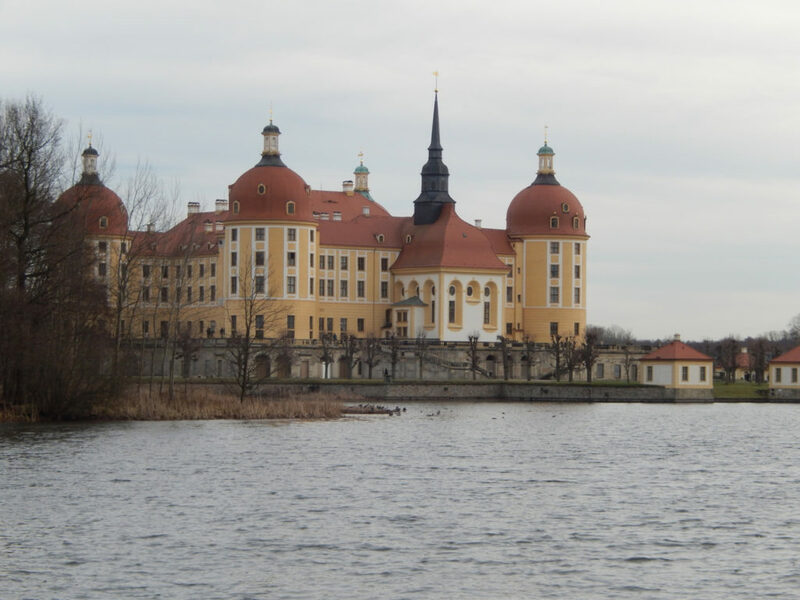 Our trip today takes us to Moritzburg Castle. The sunlit beauty holds what the view from the sky promised. We have time for a harty lunch and a strol around the grounds before we need to think about the way back. The tour through the inside of the historic place will have to wait until the summer. We will turn into a pumpkin at sun set + 30 minutes. This is when the airport will close. No time to waist, he takes care of the paper work while I preflight „Tango India“. The return trip is my leg as pilot flying. We do a radio navigation excercise. EDAK to KLF VOR, then on to the FEW VOR before we make our way home on its radial 326. We have a strong tail wind which lets our ground speed peak at 139 knots. Not bad for the little Piper! 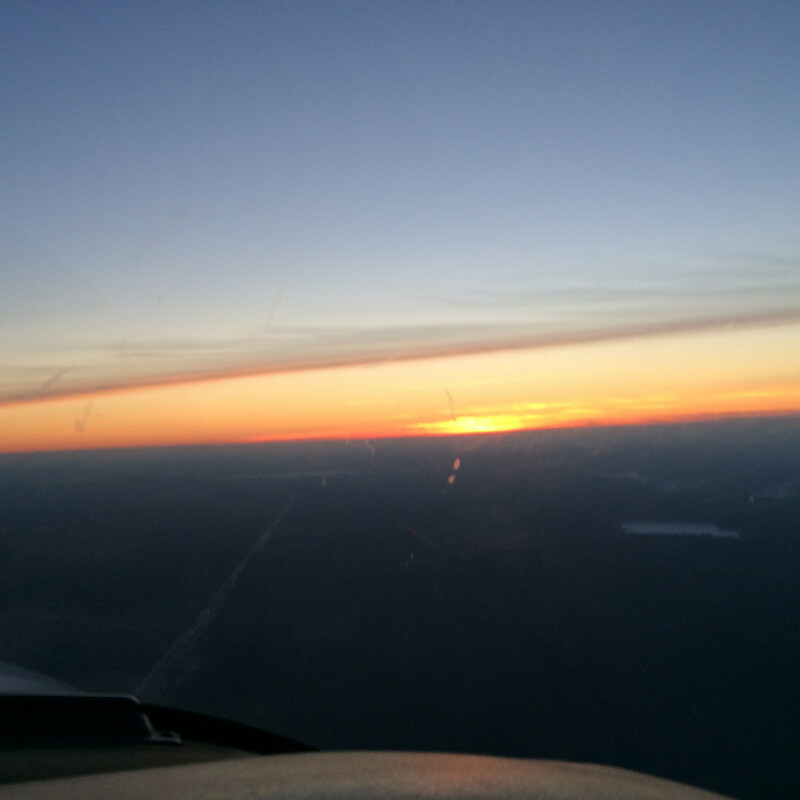 The sun is low already and we are past enjoying the last evening rays before we touch down – right at sun set. We even would have had a few minutes to spare. 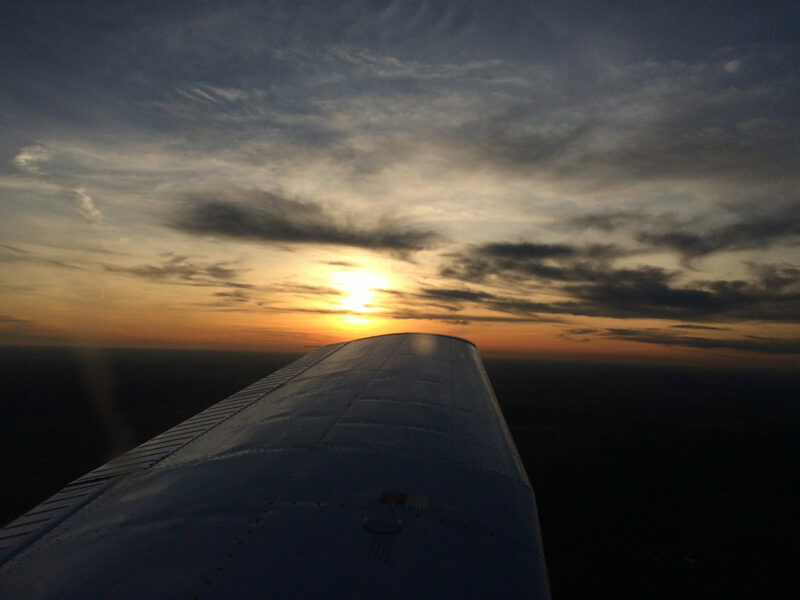 But you never make a plan that includes the last drop of fuel or the last minute of daylight. Clear winter days are great for flying. Dense air, glassy smooth and great visibility. Alas, they are few and far apart! 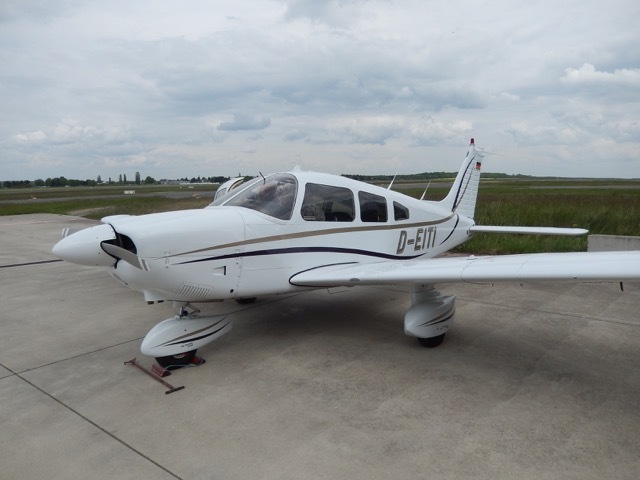 Buying an airplane … again! We are in a conference room with a tired, wooden table, a few chairs and an institutional look. The windows are overlooking the parking lot. The door across the hallway however, leads into the hangar. Full of airplanes in various stages of being serviced. The table is covered in stacks of paper. They brought two laundry baskets filled with paper to the small room. My flying friend has been looking to buy an aircraft for a long time. We have talked about it a lot, we went through options and looked at sales ads. A few weeks ago, he had made up his mind. But by the time he called the owner back, the airplane was gone. Today nothing should go wrong. We drove to Braunschweig this morning. My flying friend, his flight instructor and myself, as the driver. Someone needs to bring the wheels back if he buys the airplane. The mission today is to check-out and hopefully to purchase D-EITI. She is a Piper 28 from 1979. Her second owner is sitting at the table with us. He speaks with a calm and deliberate voice and has a tired smile. The day is emotional for him, he is here to sell the aircraft that he has owned for 27 years. This is the second time that I witness an aircraft changing owners. The first time was with my flying buddy when he got his rocket ship „Kilo Tango“. Today a slightly larger and slightly more complex airplane changes hands. The difference is mainly in the tonnage of paper. We touch a lot of paper before we get to touch some aluminum. 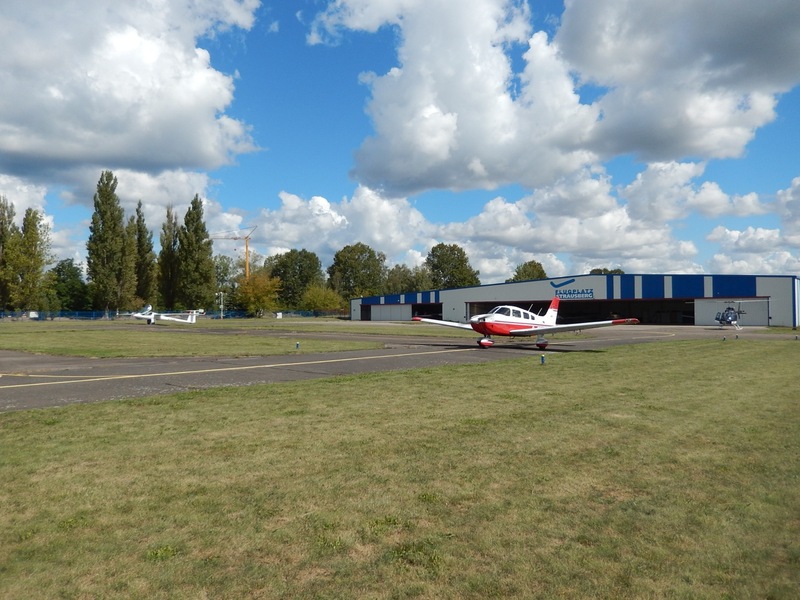 „Tango India“ is waiting for us in the sun outside of the hangar. When I see her for the first time, I am impressed. Her paint job is just a few seasons old and she looks new. We check the aircraft inside out and our first impression is confirmed: „Tango India“ has been her owners darling. She has been well loved and taken care of to extremely high standards. Everything is clean, all connections are tight, all instruments are well adjusted. She looks great! „Tango India“ flies like she looks – solid. My flying friend gets a feeling for the aircraft, the flight instructor tests her systems, I am in charge of documentation from the back. When we are back on the ground, the verdict is clear. An airplane is going to get a new owner today. Back in the conference room, the transaction is quickly finalized. 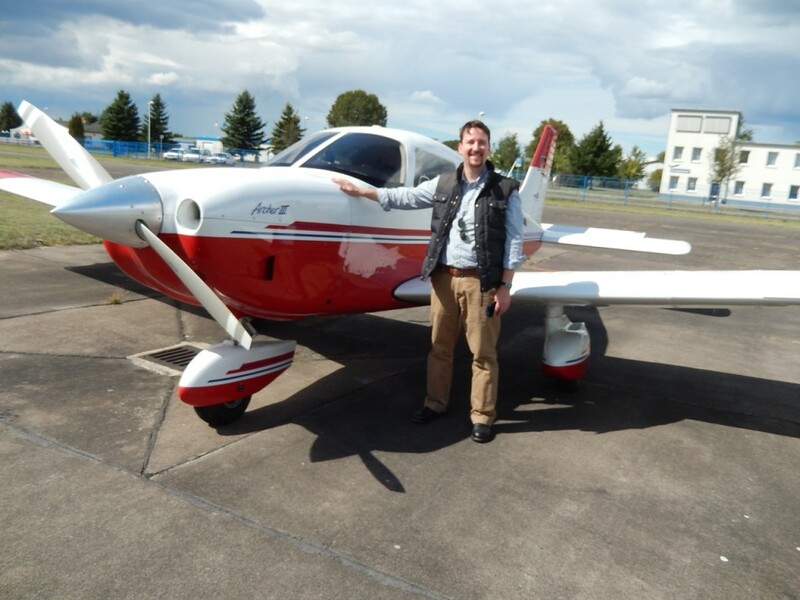 And then comes the hard part: While my flying friend and proud new aircraft owner follows the instructor to the hangar, I go back to the parking lot. What an anti climactic way to end this beautiful day! 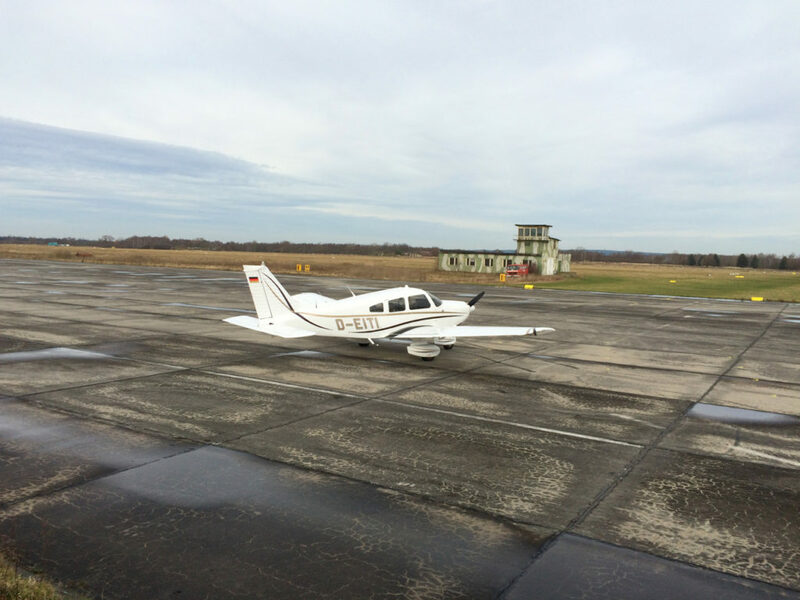 The two big names in General Aviation are Cessna and Piper. 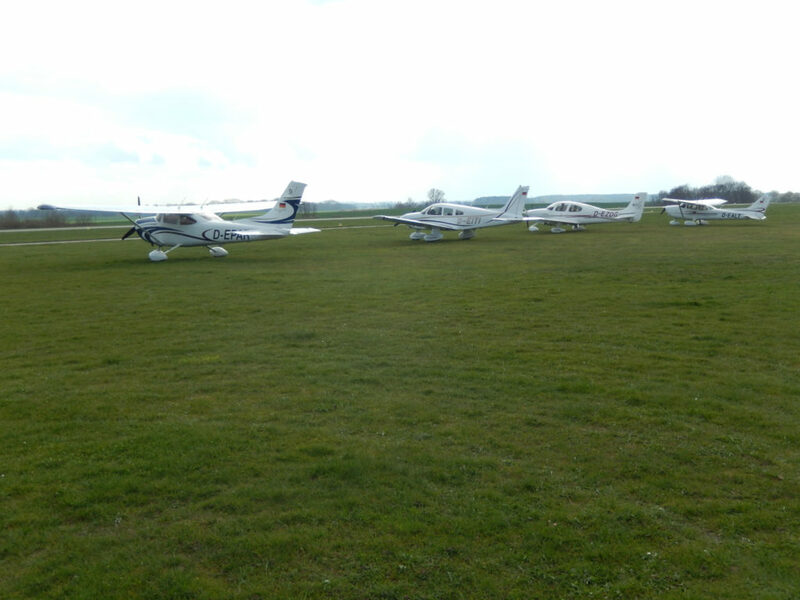 I have been flying the Cessna 150 and 152 as well as the larger Cessna 172. They are not fast and not sleek but stable, roomy (by GA standards) and make great trainers. Today I am getting to know the other side. My flight school manages a Piper Archer III and it is mine for the morning. 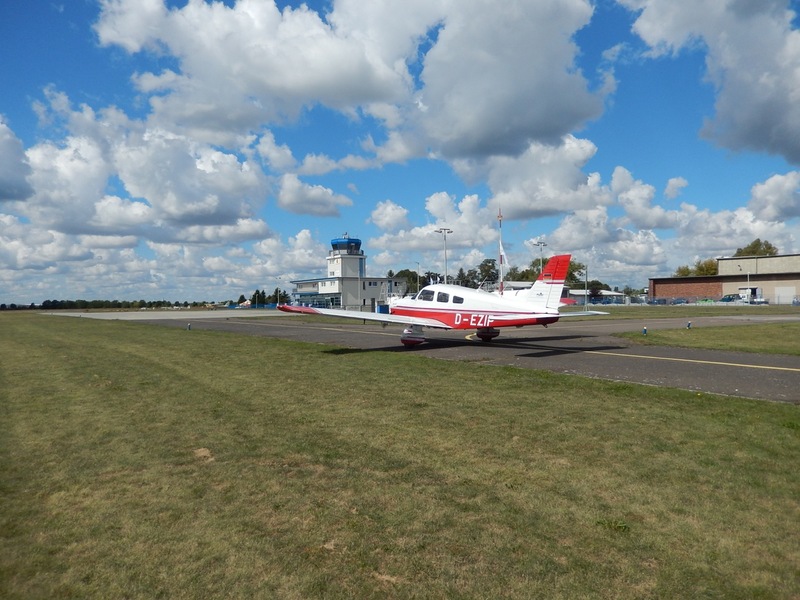 The PA-28 is a family of four seat, low wing airplanes. They have been in production since the early 1960s in many different variants. The Archer III model has a Lycoming O-360 engine with 180 horse powers, a fixed pitch prop and fixed landing gear. „D-EZIP“ has a very flashy red and white paint scheme. She is newer than the Cessnas I have trained on and she has very few hours under her wings. So she looks and feels pretty new. I have read the hand book. „India Papa“ is IFR certified. 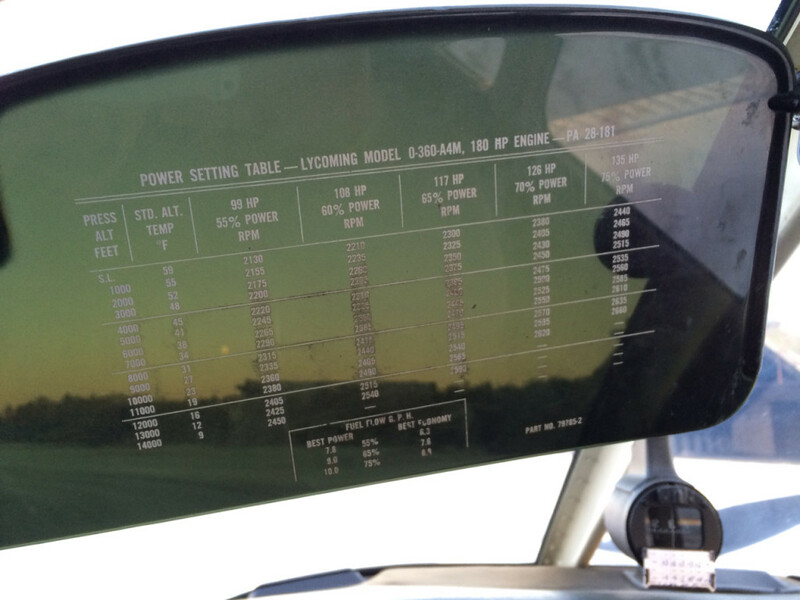 So her instrument panel is well equipped. She is a nice traveling machine or personal transporter with a few nice bells and whistles. But she is still a pretty straight forward airplane. Speeds and limitations are very comparable with the Cessna 172. 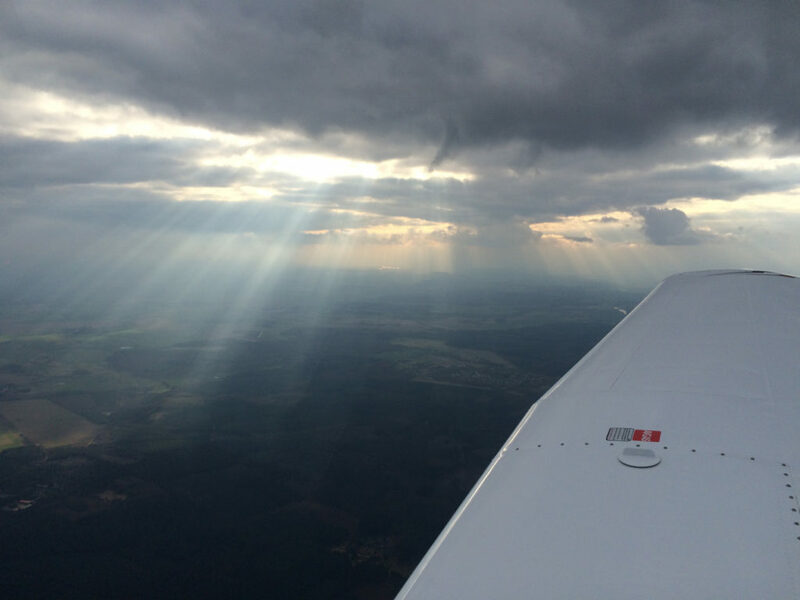 Operating her under VFR is not all that complicated. The PA-28 has a number of distinct differences to the Cessna 172. The airframe is a good bit smaller and the windows are not nearly as big. The low-wing Piper has only one door. So the pilot has to climb up onto the wing root, sit on the passenger seat and then scoot over. 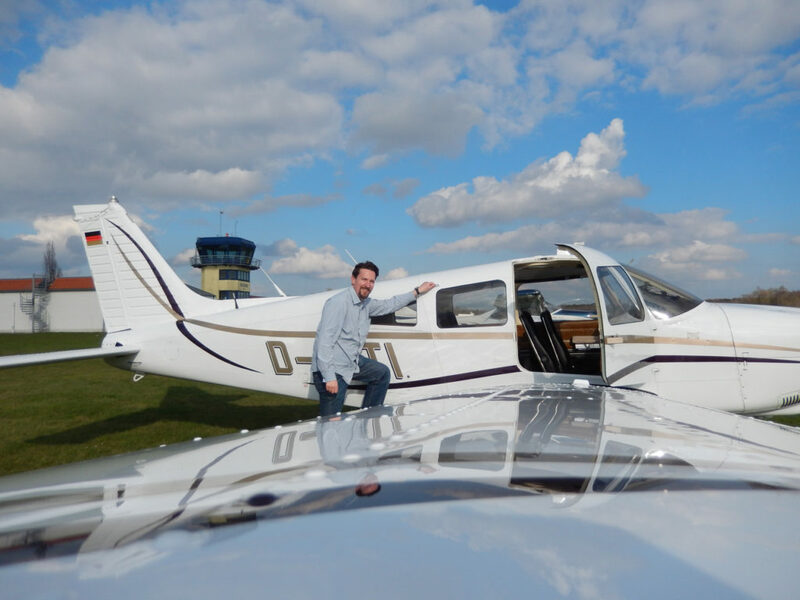 Once in the seat, everything feels very solid and a bit more serious than in the Cessna. The Cockpit is very well organized, every gauge is easily visible and every knob is comfortable to reach. New to me is the overhead panel with the switches for magnetos, fuel pump, strobes, primer and starter. Solely the trim wheel is giving me problems. It is pretty far back between the seats and I actually have to look down and lift my right leg in order to see the trim indicator. That shall give me more problems later during the flight. 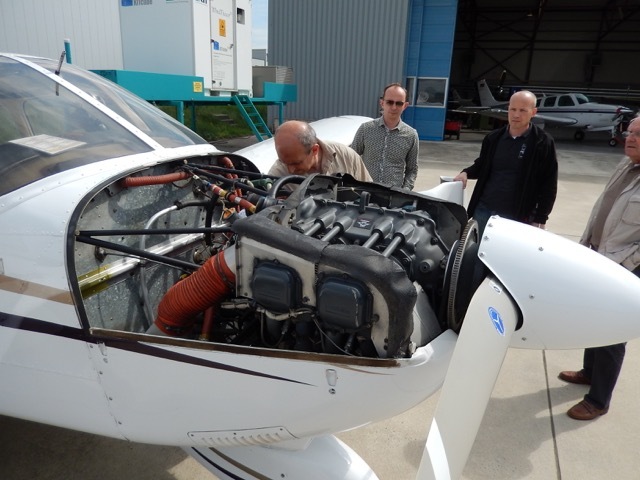 We go through the simple engine start procedure (carb heat cold, throttle position, magnetos, pump, mixture, start) and the 180 hp Lycoming starts right up. Taxiing „India Papa“ is easy enough but the front wheel is directly linked with the pedals. No hydraulic dampener – like in the Cessna – makes for a very direct transmission of forces back through the pedal. We do the run-up checks and take off. We are not heavy and the Piper climbs as expected. The forces on the yoke are pretty strong and I try the electric trim with my thumb. 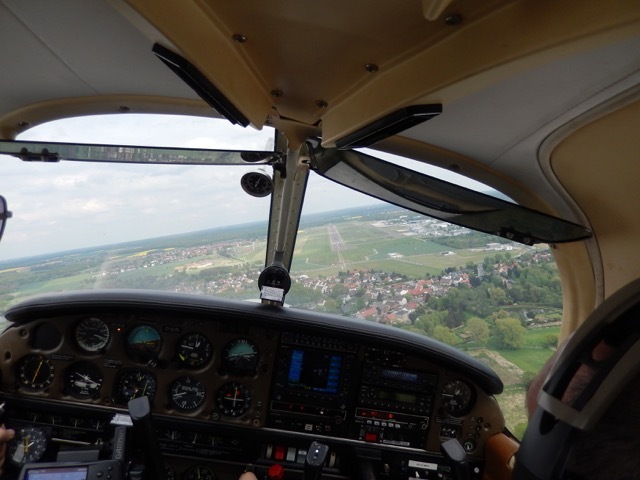 We go over to Neuhardenberg for touch-and-gos and on the way over we do the flying part of the familiarization. 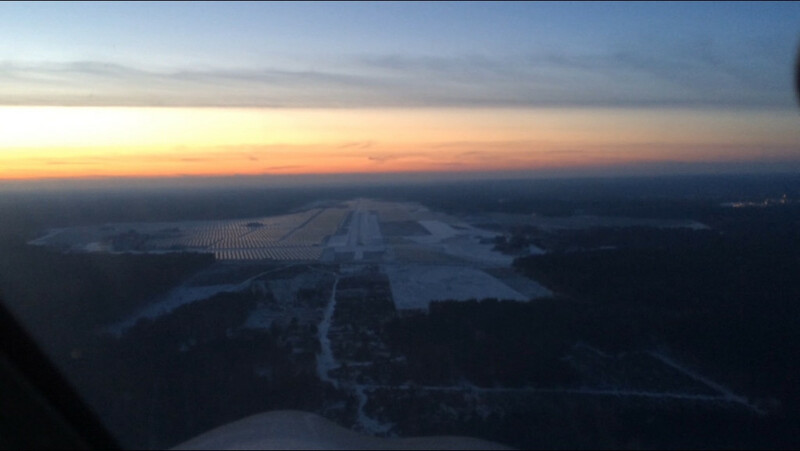 Steep turns, slow flight, flaps, stalls. All a bit unfamiliar but no real surprises. The low-wing configuration makes for less stable characteristics around the roll-axis. And the better aerodynamics and stronger engine makes for higher speeds. On the first approach that gets me a bit. I am having difficulties bleeding off the access speed and I am fighting with the trim. At the end of the down wind leg, I set the first level of flaps. The nose comes up and before I manage to trim the correct attitude, we have climbed 100 feet. On final I set full flaps and trim again. I am too high and too fast and we float down the runway for a long time before rubber and tarmac finally make contact. A touch-and-go is a fast procedure. Touch-down, retract flaps, carb heat off and throttle forward. Usually the airplane has not lost that much speed so you can rotate again just a moment later. I keep an eye on the airspeed indicator and pull. But „India Papa“ does not want to break free. The speed increases and I pull further before I finally realize that I am still trimmed nose-down from the approach. My right hand feels for the trim wheel between the seats and after a few quick turns on the wheel, the control gets lighter and the little Piper flies. The trim is a little extra tab on the trailing edge of the elevator. It is used to minimize the forces on the control yoke. The center of gravity of the aircraft varies with load and fuel. Without the trim, there would be a constant push or pull on the yoke, making it very difficult and tiresome to keep the airplane at the desired attitude. The forces on the yoke of the PA-28 are stronger than in the Cessna 172. More attention to the trim is needed. On the Cessna I can change the attitude and trim as I go along. The trim wheel is below the throttle quadrant, easy to see and to reach. „India Papa“ has a very comfortable electric trim on the yoke. But it is pretty slow, more for little corrections during cruise flight. With setting the flaps, a lot of trim is needed. The manual trim wheel for faster action is located between the front seats. 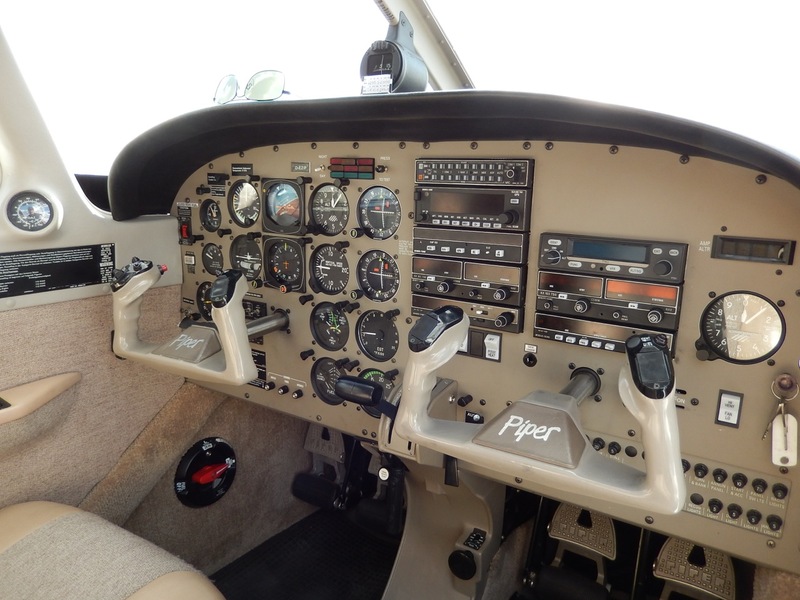 But the bigger problem for the Piper newbie is the trim indicator which is also hidden between the seats. I will have to anticipate the trimming a bit more. The next approach is a bit better already and from the third touch-and-go on, I have the amount of trim and the timing figured out. After about an hour of this, we go back to Strausberg. The last landing of the day is actually pretty lousy. 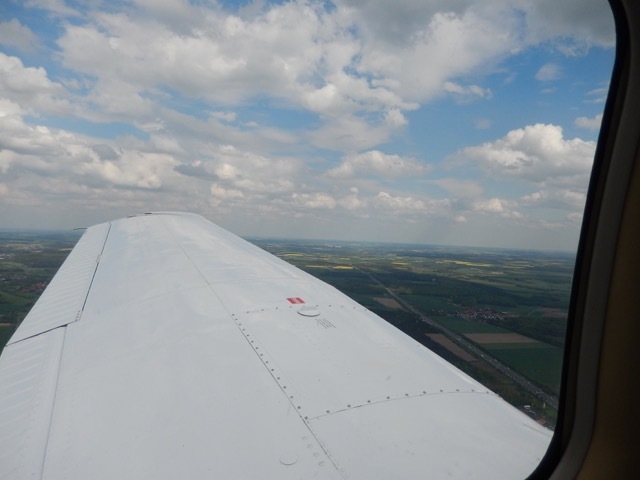 We have a cross wind and I am concentrated on keeping the aircraft on the center line. Managing energy does not work as well as I would like it to. So we are too fast on short final and are floating down the runway again. With „India Papa“ and me it was not love at first flight. But the sleek beauty tickles me and time will tell if she is an acquired taste.